It's a little late in arriving (sorry about that) but the final push of my summer vintage sled road trip with Jim Dimmerman and Tom Rowland saw us meet a legend of sorts: Gordon Rohde. A former Arctic Cat (and Harley-Davidson) dealer, opportunistic salesman, promoter and race fan, Rhode has owned or touched A LOT of historic Arctic Cat machines. 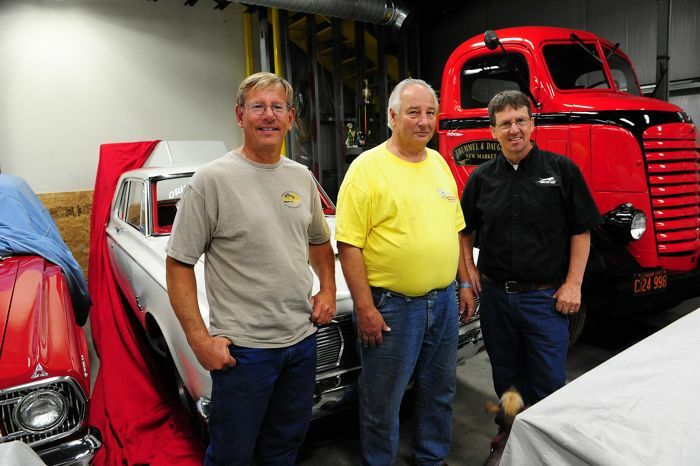 We caught up with him for a few hours at his shop in Wausau, Wis., where he answered a slew of questions about his career. Gordon Rohde is a name frequently heard in conversations with vintage Arctic Cat collectors. Among the first to intentionally obtain, collect and sell rare Arctic Cats, Rohde (pronounced Row-Dee) "touched" many of the machines that collectors now consider among the most desirable. Among them, a dozen or so 1982 prototype Arctic Cat's from the last days of Arctic Enterprises; a 1974 Sno Pro that had been Larry Coltom's, and another that was Rich Porter's; IFS Sno Pros; prototype engines; and oodles of parts. Depending upon whom from the colleting world you ask, Rohde was either a great dealmaker and fellow collector, or someone to be weary of. In a hobby where ownership, verification and big money often mix into a weird soup, it’s nearly impossible for everyone at the table to agree on the taste. I learned long ago to form my own opinions about collectors rather than simple trust the often-jaded perspectives of others. Good thing, as the few hours that Jim Dimmerman, Tom Rowland and I spent with Rohde were truly enjoyable. The man we met was kind, introspective and utterly without an ego. He answered every question we posed with grace and a sharp memory for someone who stopped accumulating stuff nearly 30 years ago, and who started selling nearly as soon after. All three of us realized there was more to Rohde than what we’d previously heard. For instance, Rohde was one of the first entrepreneurs to build three-cylinder Cat/Suzuki engines utilizing Sno Pro cylinders, which he sold at retail and provided to the Rill Reynolds/Mike McArdle drag efforts in the late 1980s and early 1990s. That was a successful three-way partnership that hauled home grass and ice drag wins from all over the country. 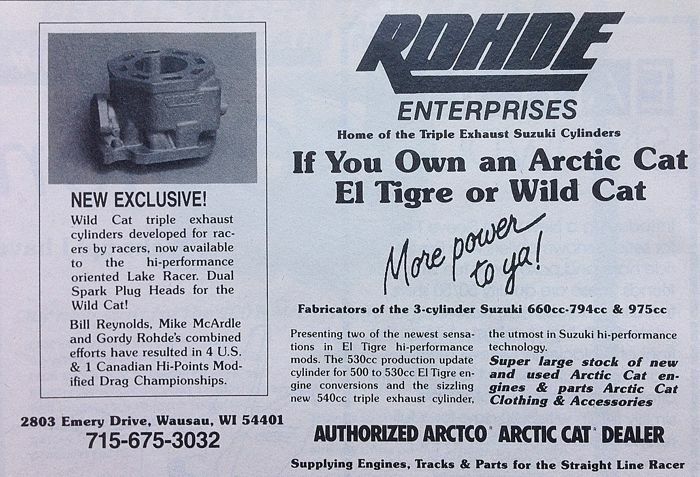 Plying his knack for resourcefulness, Rohde started buying Sno Pro goodies from sources connected with Arctic Cat even before he became a dealer in 1987. It was those early purchases – most through the Salvage department – that netted Rohde much of his vast array of vintage parts. He used the same resourcefulness to source Suzuki motorcycle engine parts that he used in snowmobile engines, once coming to market with a particular, new design that nearly beat Arctic Cat. 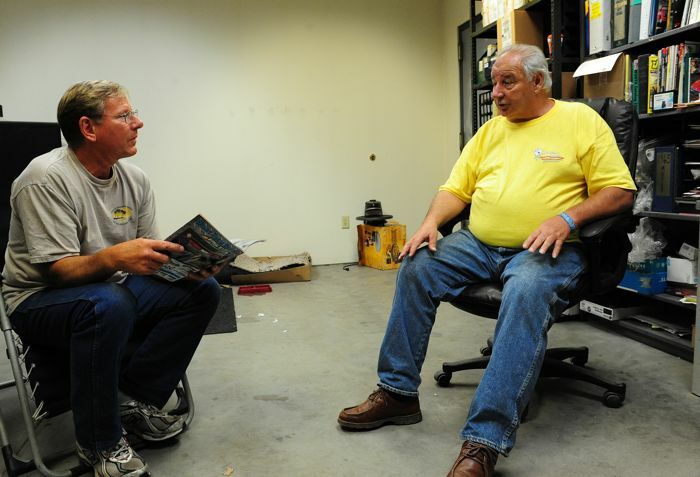 But before all that, Rohde developed his aptitude for the snowmobile business from his years working for his dad’s Polaris dealership, which began in 1961 as the first snowmobile dealer in Wausau. It was there that Rohde learned the often tough lessons of competing on price and inventory. 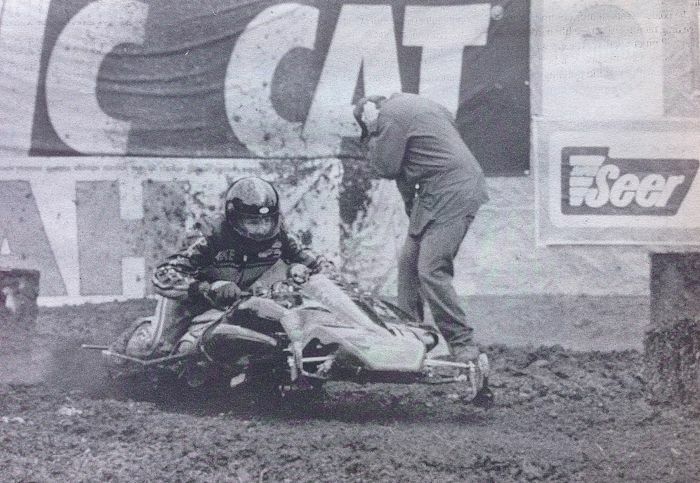 They were lessons he would hone when he bought out an existing Arctic Cat dealership in Wausau in 1987. That venture would last until 1998. Rohde is one of a relatively few who raced at the very first Eagle River World Championships, held in 1964 on Dollar Lake. The passion for competition always burned hot, leading Rohde to stints of competition aboard Alouettes, Tradewind and Polaris. Racing would remain close to his heart, as evidenced by the sleds he purchased and the engines he built. Other ventures came and went. One particularly smart move was his purchase of a Harley-Davidson franchise in 1990. He grew the business well and sold in 2006 (which was nearly perfect timing with the Great Recession to hit a year or so later). For snowmobile enthusiasts who had bought rare gems from Rohde, 2009 marked the last chance to make a deal on his what was still a remarkable collection. That was when Rohde held an auction, during which truckloads of gems left his hands for new owners. A massive load of truly phenomenal items went to Darnell Nuhn of Stratford, Ontario. Darnell has subsequently parted with some choice items, many of which have made the show circuit via new owners. During our conversation with Rohde, we asked whether he still has a stash of rare snowmobile items. Nope, it’s all gone. A tour of a massive building on his property showed lots of Harley-Davidson stuff, but almost nothing snowmobile related. It’s true the three of us felt some disappointment that there was no secret stash, but we’d already been quite enriched by the conversation with Gordon. There’s no need for dessert when the main course is entirely fulfilling. These days, the 67-year-old Rohde is enjoying retirement. His collection of pristine American muscle cars (stored in his climate-controlled shop) is testament to his current passion. Hard work, resourcefulness, risk-taking and well-timed business decisions have rewarded Rohde well. That said, I detected absolutely ZERO air of financial well-to-do from him. On the contrary, Rohde exuded a work ethic learned from holding multiple jobs through his entire life. This is a man who has worked very, very hard. I will admit that after shaking hands with Rohde and driving away, I was a little bit disappointed that Rohde hadn’t kept something that connected him to his decades in the snowmobile world. But I don’t begrudge him for this. Somewhere between Wausau and home, I realized that inside the trailer we were towing was a prototype 1982 Arctic Cat Panther that was now Tom Rowland’s. Like all of Tom’s amazing sleds, this one will be on display at future events, and will likely be ridden from time to time. That ’82 Panther had passed through Rohde’s hands many years ago. Rohde had already played his part in the whole process. I’m thankful for that. Mike McArdle (above) raced Reynolds-built sleds with Rohde triple engines to many, many drag race victories. Thanks for part 3 of your adventure this summer. Great ending to what I am sure was an exciting time. Gordy is another walking encylopedia of Arctic Cat history for sure. Jim, make sure that John gets this all put on paper to be preserved for history. Next interview has to be with Darnell Nuhn to get his take on Arctic history and what he has done with all of the Arctic parts he purchased from Gordy. Since John and Tim are still young pups and were not around during the muscle car era, that Savoy and Coronet are some special. My high school buddy owned a 66 Hemi Coronet he bought when he came back from Viet Nam. Kept it a couple of years, soeeding tickets and insurance forced the sale. he got to know the local police force on a first name basis. Sure would like to take the truck in the background for a spin around town, Jim is it a GMC or Chevy? 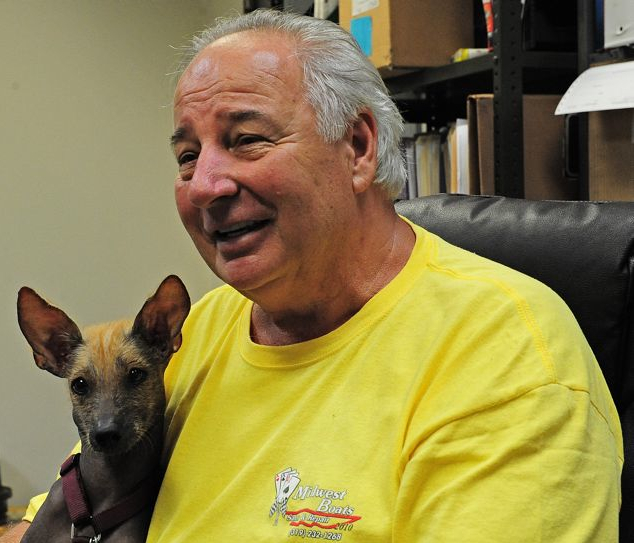 Thank you Gordy for sharing your story! There is nothing quite as sweet-sounding as a race hemi! I was once standing at the back of my friend's dad's race trailer when he fired up his '64 Plymouth Savoy 426 Max Wedge A/SA stock eliminator and it about blew my hat off. Wow!!! Glad to finally see a story featuring Gord Rohde! Unless you followed drag racing in the 80's and early 90's, it would probably be hard to really appreciate how important Gord was to Arctic Cat. After the demise of Arctic Enterprises, many racers jumped ship and decided to race the other remaining brands.... Gord's ideas and engine building techniques kept the Arctic Cat name in the Winner's circle during the "dark days". I was very fortunate to purchase some of Gord's engines and parts from Darnell and can tell you guys that his port work and tuning abilities are second to none, and his 530 triple exhaust port engines are very, very fast....even by today's standards. Thanks for the story! It was great to finally meet Gordon, after hearing about him for three decades or so. As written above, the guy was as eager to speak about his time in the snowmobile industry as we were to hear it. It would have been great to know him in the 1990's when his buildings were filled to the rafters with sleds and parts that are so sought after today, but, that was a period when so many thought that the only collectable snowmobiles were 1966 and older...probably wouldn't have had the foresight to buy much anyway. It's always a delight when a guy like Gordon is willing to share a few stories and memories with guys like us, it certainly brings new perspectives to light. Thanks Gordon! It's a pokey quick sales kind when considering Timberlthen in spite of owners placing extra techniques on the heels of these item's engineering advancement. Gordy was a great friend that I lost touch with. I will always be grateful for the knowledge he shared with me, taking me to Thief River and showing me around. What a wealth of knowledge he has with Arctic Cat products! Thanks Gordy for the great times I had in Wausaw ! To answer your quieostn I listen to you and Earwolf's How Did This Get Made? That is it. (Also, they have to be reviewing a movie I am interested in or I skip that episode. I am a fan of The League on FX and two of the actors from that are on the podcast. )I have tried lots of other pocasts but finally have stopped trying. I download them they stink I delete I am tired. Don't go anywhere, I need you to fill my ear holes.